EZPaperTrail is an easy to use web application that helps you send requests for purchases, substitute teachers, IT Help, and more among the staff at your school. Simple forms and detailed reporting help you track requests and inventory at your schools. We host everything so all you need is a web browser & an Internet connection and you can start using it right away. Manage staff requests for purchases, reimbursements, bills, field trips, substitutes, professional development, and help tickets. Sync with QuickBooks desktop software. Sync vendors, state account codes, and bills for all your spending to avoid extra data entry. Every request has a custom approval process and workflow that you define. See who did what when with individual user accounts and timestamps for every action. Budget your money and generate the State of Michigan accounting report each year quickly and easily. 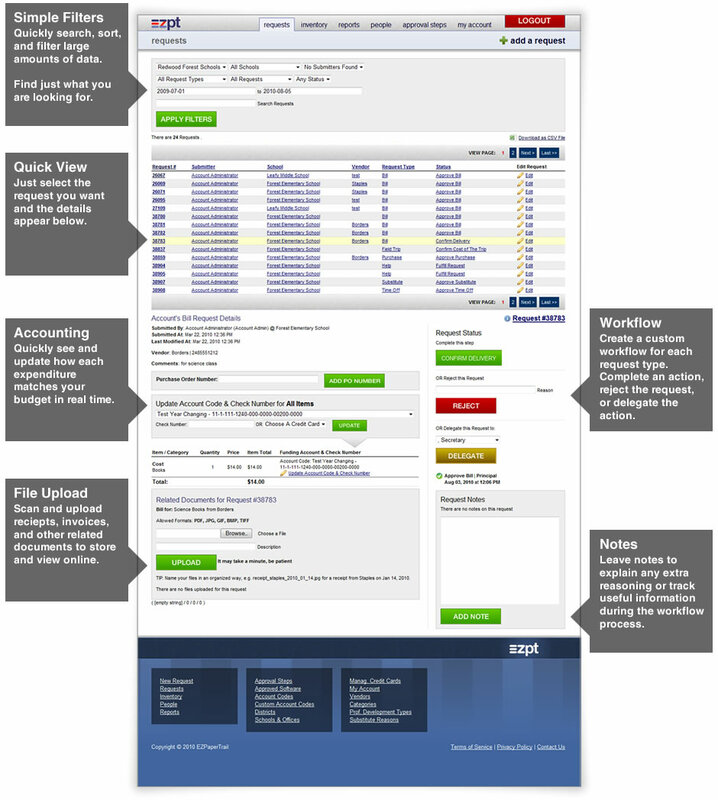 Quickly run reports for accounting and auditing. Help tickets with performance reporting for Information Technology, Human Resources, and Facilities staff. Easily delegate requests as needed. View reports on spending, professional development, and help ticket performance. Filter and search your data to better understand what is happening at your schools. Scan and upload all your paper documents for easy archiving and retrieval. Store invoices, bills, vendor contracts, teacher certifications and more. EZPT automatically adds items you purchase to your inventory. Simple tracking and individual accountability for every item.